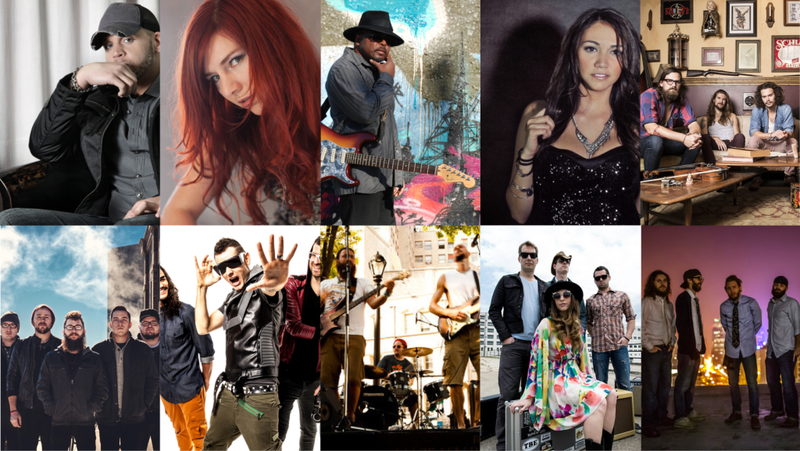 Artists pictured above (L to R, from top to bottom): Benton Blout, Marina V., David Gerald, Sarah Ross, Radio Birds, Fivefold, Rapture Ruckus, Aaron Kamm and The One Drops, Angela Perley and The Howlin Moons and Old Salt Union. Country singer Benton Blount, will kick off the Levitt AMP Jacksonville Music Series with the powerful voice and heartfelt songs that carried him to the final rounds of America’s Got Talent. June 10 | Marina V.
Check out this soulful guitarist who is making waves in the blues and rock communities. At the age of 19, Sarah Ross is already helping to blaze a trail for women in the fast-growing country/rap/hip-hop genre of music. Radio Birds’ lively, heartfelt Americana style is the result of four guys writing music together under the belief that it must be played live, and it must be played everywhere. Fivefold has developed a distinctive sound that is powerful, unique and different than what you would expect to hear from a standard heavy rock band. Formerly a Christian hip-hop crew, Rapture Ruckus now infuses multiple musical genres into their sound, creating their own unique brand of Christian rock. Aaron Kamm and the One Drops merge flavors of roots reggae, Mississippi river blues, improv-laced jams and soulful vocals. Angela Perley’s nostalgic and high-energy rock music tells stories of love, death, railroads and everything in-between. Old Salt Union is a bluegrass band that takes pride in playing music by its own set of rules. This entry was posted in Levitt AMP and tagged Levitt AMP Jacksonville on April 15, 2016 by Nicole McGaffey.